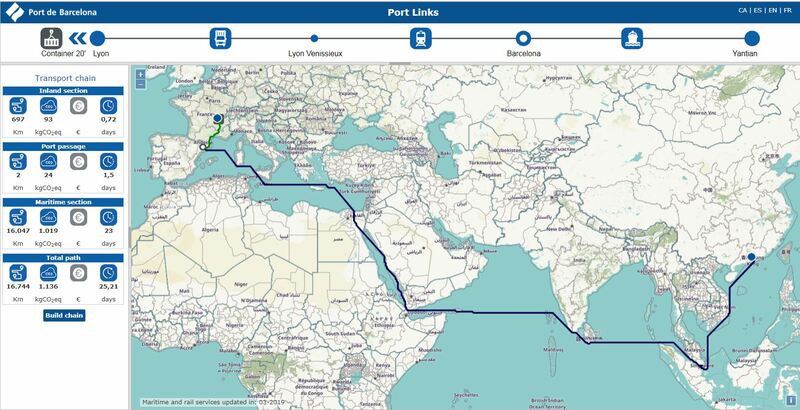 Port Links is a web-based tool for building transport chains through the Port of Barcelona and calculating distances, emissions, cost and transit time. Port Links formulates detailed transport paths on a map and estimates transit times and emissions along with other externalities, for each segment – land, port and sea – and for the whole chain. It uses the Port of Barcelona’s maritime and land-based services and provides a list of indicators associated with the transport chain that has been built (distance, transit time, emissions and externalities) and a representation of the route on a map. It uses the emission calculation model developed by the Port of Barcelona under the ECOcalculator project. The web tool has been designed to build complete logistics chains between any port foreland in the world and any European hinterland location. Once the full route has been calculated, the user can navigate freely to explore the results. The map provides a graphical representation of the given route and the model displays aggregate results for distance, CO2 equivalent, emissions, cost and transit times.